Carole Simpson-Hadley had the most liked content! Here's one for the film buffs...... Yesterday (Wednesday October 24) we visited South Wales in Myfannwy, our X150 XK; the location of picture 1 is the end of a coastal lane which featured towards the end of a well known film, east of Penarth; picture 2 is of a location from the same film which has been,over the years, much sought out and photographed. But exactly where, and in what film. Clue : it wasn't Gavin and Stacey! Answers, on a Jaguar service book, to this thread. Don't stay awake all night wondering. 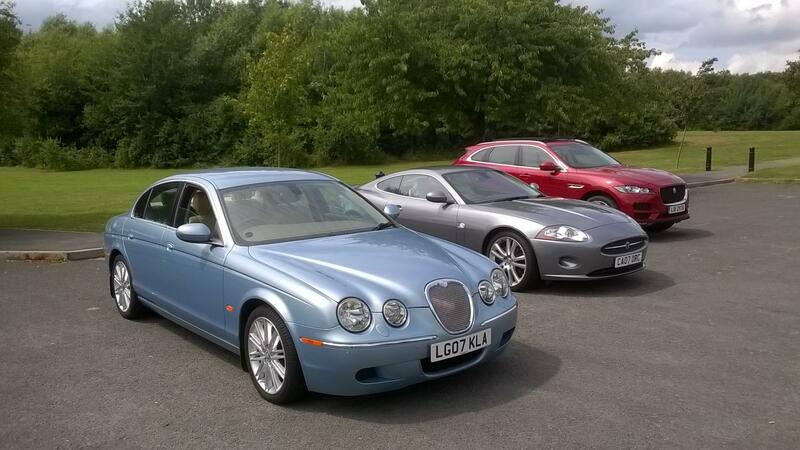 Jaguars at Bicester - tempting! Now if you happen to sport a "bonnet" badge of this type then you are, indeed, a lucky person.................only to be found on the Formula One racers carrying the Jaguar name in the days of Eddie Irvine etc; long before Formula E etc! Photo taken at the Donnington Circuit Grand Prix Collection on Wednesday October 17 and, sadly, for those of you who haven't been.....time is running out as the entire Grand Prix Collection (including the Military Vehicle side) is closing down on November 05. The cafe and shop are already gone, and, on the day we attended, the display cabinets were either empty or in the process of being emptied. Most of the cars are still there, including the Vanwall Collection, many McLarens and Force India, and, of course, the Jaguar F1 cars........two in team colours and one painted to show the high and low pressure air areas - green for low and red for high, and everything in between. Feast your eyes, but remember there's not long to go! 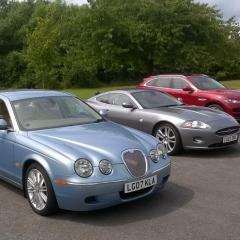 Meanwhile, our Jaguars will continue to sport the correct bonnet badges........drat the CCTV!! Just to be clear, this isn't a restored D-type from the '50s. This is one of the "continuation" run of 25 D-types newly created at JLR Classic. The original intention of Jaguar was to build 100 D-types but only 75 were completed. Thus the "new" 25 fulfil the original intention, built in either short or long-nose form. The one pictured is long-nose. This is the third "continuation" production. The first was the missing 6 Lightweight E-types built in 2014/15, followed by the 9 XK SS which, in original form, were destroyed in the Browns Lane fire of February 1957. We can but dream!! Thankyou Steve! The gent in the D-type is actually the engineer i-c, Kev Riches, a font of knowledge but very friendly. MOH, as always, was in the shadows.............. We are not sure about the block and tackle factory option but did witness the factory option bonnet nose protector masquerading as a kneeling pad....see additional photo. The second additional photo is of the electrics nerve centre of the D-type, from the days when things were repairable and OBD readers were subscribers to 'Otspur Beano and Dandy. Ref the Eventer, we take your point.......full payload might be one hamster, with a possible stretch to a guinea pig. Answer to question "why? "......probably because you can. But what a great experience; sadly, D-type and XJ220 are but a pipe dream, particularly when you consider that the 2 year service on a XJ220 includes new clutch and all engine belts, at a cost of circa £6K. And one for yourself, guv. Continue to enjoy your Black Bess but do consider a visit to JLR Classic if you get an opportunity; you will not be disappointed. Yes, that's right.......Saturday last (September 15) gave us the privilege of lining up our XJS "Purrrdy" alongside the D-type at JLR Classic at Ryton; what a day to remember! The occasion was a special day set up by the XJS Cabriolet Club whereby all various XJS club members were invited along; similar to the Jaguar Breakfast Club "XJ at 50" event two weeks previously (subject of another thread under Jaguar Lounge) when 200+ XJs lined up at JLR Classic, with a further 140+ various Jaguars across the road at SVO. There were some interesting and rare examples of the XJS, including a Lister, a Le mans Edition, and an Eventer estate. The usual selection of JLR Classic staff were on hand, as always happy to discuss the various projects underway (XK SS, D-type, E-type Reborn, XJ220, LR and RR Reborn etc). They are all a credit to their profession. As always, the JLR Collection was also available for viewing. One of the senior project engineering gents (as seen on the TV series about recreating the XK SS on C4) kindly decided to bring the D-type around to the front (accompanied by some beautiful sounds from the XK power unit fed by triple Webers) as a photo opportunity............enough said. Spot the difference in the first photo! Wanda the mascot does, of course, have to have the last word in the last photo. The mascot in our XK is named Felixstowe, on account of his name was Felix but he stowed away. Also, he likes Suffolk. As Ryton is not in Suffolk, he stayed at home for this event. Oh dear. Pass the sedatives. Well said R2E........MOH has checked the shed and garages for removed redacteds, but didn't find any. It could be the case,of course, that Jaguar, in cohorts with NHS, have superseded the part number. With regards to the "little jump".......is the forum redacting programme on a weekend off??!! Happy getting in and out P.S. We do find the S-type easiest, with the auto seat movement. Perhaps, as you seem quite handy, you could fit a rise and recline chair? As an additional comment, there were over 200 XJs at JLR, plus 140+ other Jaguars, from early XKs through E-types etc etc to F-types, S-types and so on, on the SVO car park across the road from JLR Classic......what a gathering! Take a look on You-tube.......the "Moves Like Jaguar" site where there is also coverage of the Jags at the Castle event at Warwick Castle. Next outing is again to JLR Classic, tomorrow (Saturday September 15), which is a special XJS event, ticketed, on behalf of XJS Clubs. Purrrdy is ready to roll! Fortunately, Steve, Claude is having issues with his GPS and was last seen explaining why wisps of smoke were visible from the local shopping centre which once hosted Maplins, Comet, BHS, Toys R Us etc., all of which have gone up in smoke, possibly due to unauthorised marketing of Welsh memorabilia. Claude enjoyed visiting as he commented that the floor assistants usually had "dragon breath", particularly on a Monday morning. As a result of the aforesaid GPS issues, he may have by-passed your abode, although Black Bess may well appear on his dashcam footage. Meanwhile, reference the "afterlife ushers", we have recently gone quiet on the forum due, in equal measures, to spending our time spoodling Purrrdy (our XJS) and also watching our box set of "In Loving Memory" to see if we could pick up any tips. Finally, much agreement reference the classic credentials of the S-type. Our '07 run-out in Seafrost with Barley trim is an (almost) daily driver but receives as much attention from us as the XJS and X150.